In the night of June 14th, some artists who wish to remain anonymous made a contribution to MURAL Festival 2018. The piece is a postmodern, extinguisher acrylic on bank window, measuring (approximately) 15ft x 8ft. More specifically, we sprayed the facade of the National Bank on Saint-Laurent Boulevard with a fire extinguisher filled with black paint. It is obvious that politics, both the G7 politician’s and the social activist’s, is a dead end. The problem is figuring out what to do instead. We choose to experiment with confronting that which seeks to turn every part of our lives into a commodity. We’ve watched the state waste hundreds of millions of dollars on a security apparatus for the spectacle of a summit that bears little relation to our lives and long-term struggles. Instead of falling for this trap, we enjoy acting when and where the cops are not expecting us. We will continue to do so. 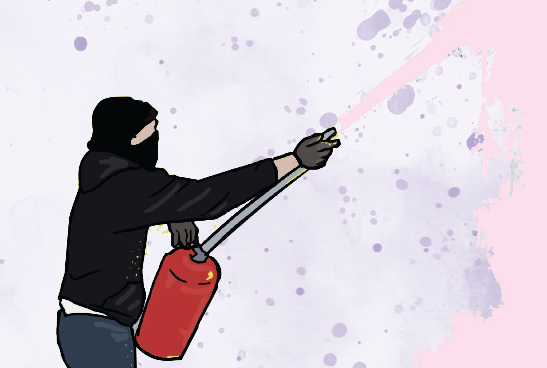 Solidarity with the anarchists facing repression in Quebec City, Montreal, Hamilton, and worldwide.